For many coaches, swimming is a lifelong passion. The process of cultivating philosophy, learning technique, training and communication methods is continuous over a lifetime. The top coaches in the world are students of the sport. Like sponges the top coaches (and athletes) absorb all of the information they can. They interact with other coaches and athletes of all levels and determine what would (and would not) work for them and their athletes. The opportunity to interact and share is highly valued. 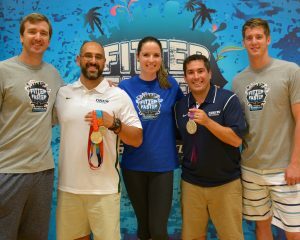 At each clinic and camp, Fitter and Faster Swim Tour offers the opportunity for coaches to engage in conversation with elite swimmers and coaches. This is a chance to ask questions about training, nutrition, balancing school and swimming and more. 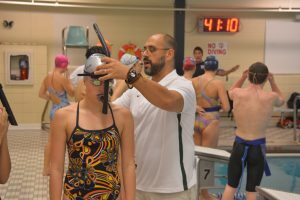 Since its inception Fitter and Faster has encouraged coaches to attend clinics with their participating swimmers. FFT always creates easy access for coaches to observe and ask questions. FFT will continue to offer this opportunity to all coaches. Additionally, beginning in 2015, at every Fitter and Faster clinic, the clinicians will meet with four local coaches privately to review the session’s “Run of Show” and have an open discussion. These coaches will then work alongside the clinicians on deck and in the gym during the clinics. This opportunity is open to a mix of the host team’s coaches and other local coaches. Coach Crystal Keelan of the Penn Charter Aquatic Club (Philadelphia, PA) was one of the first coaches to participate in the program. During the Elite Speed and Power Camp in Madison, NJ, Coach Keelan travelled from Philadelphia, PA to attend the camp with one of her star 14-year-old swimmers, a current national age group record holder. 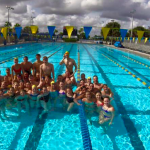 At this camp Keelan worked with Olympians Jimmy Feigen, Kara Lynn Joyce and strength and conditioning coach Nick Folker for two days. “My experience working with Kara, Jimmy & Nick was exceptional. They treated me as an equal – even though I don’t have the resume they do. 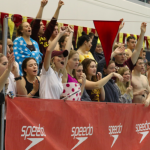 It was clear they love working with all swimmers, which made the Elite Camp a positive experience for everyone involved” said Keelan. Other coaches so highly value the opportunity to collaborate with Fitter and Faster clinicians that they have traveled across the country to attend clinics. 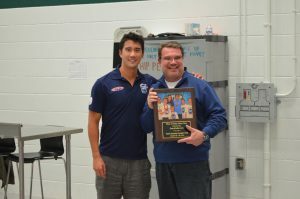 Coach Andrew Nguyen from the Bellevue Club Swim Team in Seattle, WA made the trip from the Pacific Northwest all the way to the east coast, to work alongside strength coach Nick Folker. FFT’s “Collaboration Program” is bridging the gap between the elite level of the sport and the grassroots in a way that benefits both groups in a positive fashion. Age group coaches across the country are building great relationships with Olympic and elite athletes they may only have known by name. Coaches interested in attending or participating in Fitter and Faster clinics can contact us at fitterandfaster.com. With more than one hundred sessions annually throughout the country and the ease of creating new sessions – the opportunities for exchanging valuable information is extensive.